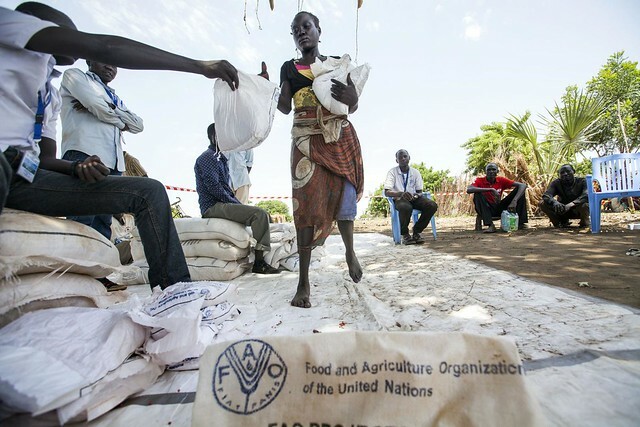 The UN Refugee Agency and the Food and Agriculture Organization of the United Nations (FAO) have distributed seeds and agricultural tools to 200 000 refugees and their host communities across South Sudan to help them become more self-sufficient in a country facing a serious food crisis. Assessments have shown that the food and nutrition security situation is worrying in many parts of the country, including in Upper Nile – a region hosting four refugee camps and South Sudan’s largest refugee population of 134,000 Sudanese refugees. A nutrition survey, conducted in late 2015, found that Upper Nile’s Maban refugee camps registered higher levels of malnutrition compared to 2014. This was particularly the case in Doro camp, where the rates of Global Acute Malnutrition (GAM) and Severe Acute Malnutrition (SAM) were respectively 15.5 percent and 2.6 percent – above UNHCR standards of 10 percent and 2 percent. “To quickly respond to high malnutrition rates we are distributing nutritious food for children under five years and all pregnant and breast feeding mothers. We are pleased to announce that these interventions are working well, but we are also looking beyond quick-fix solutions that help refugees become more self-reliant and less dependent on humanitarian assistance in the long run. This is the essence of the UNHCR-FAO partnership,” says Ahmed Warsame, UNHCR Representative. This year, the two UN agencies have jointly contributed 186 tons of crop seeds, assorted vegetable seeds, hand tools and fishing kits for refugees and local communities in Unity, Upper Nile, Jonglei, Central Equatoria and Western Equatoria. This donation will enable communities to start planting their cereals and replenish their stocks, in so decreasing food shortages. While many have received assistance through direct distributions in the past, in 2016 refugees in Central Equatoria were invited to attend seed fairs for the first time. With this FAO, in partnership with UNHCR, strives to help transform agriculture in South Sudan by facilitating the sale of high quality local seeds instead of imported seeds. At the fair, vulnerable farmers were issued with vouchers to be exchanged with local traders for seeds which directly injected cash into the local economy. “Without seed distributions we cannot survive. Not all of us are able to maintain seeds for next year, some people do, but because of a lack of food, sometimes we are forced to eat the seeds maintained for planting,” Michelle, Sudanese refugee from Blue Nile State. “We hope for peace so that we can return home, where we can be free,” she added. FAO and UNHCR are committed towards increasing refugees’ access to livelihood opportunities and reducing dependency on humanitarian aid. Of late, a joint livelihood strategy for South Sudan was launched looking to address this issue with a clearly defined action plan. The strategy targets both refugees (70 percent) and local communities (30 percent) in refugee-hosting areas across the country.